World Youth Day 2011: thunderstorm cut short Pope's speech. Home Arts & Culture World Youth Day 2011: storm cut short Pope’s speech. World Youth Day 2011: storm cut short Pope’s speech. [googlead tip=”lista_medie” aliniat=”stanga”]A thunderstorm has forced Pope Benedict XVI to cut short his yesterday speech during a prayer vigil at the Catholic Church of World Youth Day 2011 festival in Madrid, Spain. More than 1.5 million young pilgrims gathered at the church of World Youth Day 2011 festival on Saturday to be in place for the vigil when a flash, blustery downpour drenched the crowd and forced Pope Benedict XVI to suspend his speech. During the day, before the procession, firefighters atop fire trucks had sprayed the crowds with water from hoses, and pilgrims sought shade from umbrellas, trees, tarps and tents in a bid to stave off the near 40 degrees Celsius (about 104 Fahrenheit) heat. Once the rains stopped, about a half hour later, Pope Benedict XVI merely delivered brief greetings in a half-dozen languages, skipping the bulk of his World Youth Day speech. Despite the discomfort, the scene at the Cuatro Vientos airport was nevertheless festive and colorful, with pilgrims in a rainbow of sunhats dancing, singing and waving their national flags as they geared up for a massive sleepover ahead of Sunday’s main World Youth Day Mass. The crowd erupted in cheers when Pope Benedict XVI arrived at nightfall, greeted by Spain’s crown Prince Felipe and Princess Letizia. But he couldn’t proceed with his speech because of the thunderstorm and organizers told the crowd that they had asked for more water during the day when it was so hot, and their prayers were answered. 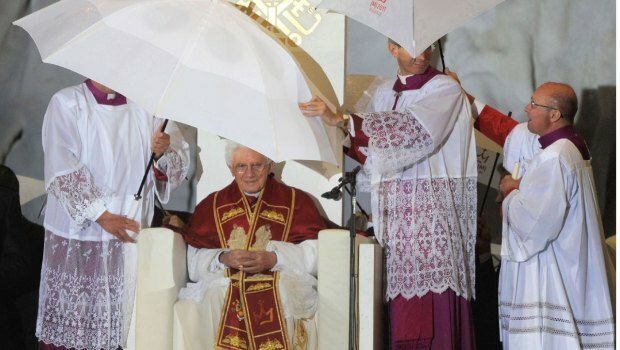 “With this rain, the Lord sends us many blessings,” Pope Benedict said when he resumed his shortened remarks. Reverend Federico Lombardi, Vatican spokesman said that when the storm started, Pope Benedict had been asked by his aides what he wanted to do and he insisted that he wanted to wait the storm out. The 30 minutes delay was due mainly to the failure of the sound system; once it was fixed and the storm passed, Pope Benedict proceeded with the vigil program, he said. According to organizers, six people were slightly injured when a tent collapsed during the storm. Pope Benedict XVI attended World Youth Day for the third time. World Youth Day is a once-every-[googlead tip=”vertical_mare” aliniat=”dreapta”]three-year event and gathers young Catholics from all around the world and was launched 25 years ago by Pope John Paul II in a bid to reinvigorate and spread the faith among the young. World Youth Day festival looked pretty much as a weeklong rock concert and camping trip, with bands of flag-toting pilgrims roaming through Madrid’s otherwise empty streets to take part in prayer and education sessions, Masses, cultural outings and papal events. “I haven’t been able to catch the pope’s exact words because he has spoken only in Spanish but it is an amazing experience to share these moments with so many people from so many different countries,” said Joseph Maduma, a 16-year-old student from Tanzania. “We have come to spend the night here and really look forward to meeting lots of new friends,” he said. Earlier Saturday, Pope Benedict celebrated a Mass with nearly 4,000 seminarians at Madrid’s main cathedral and announced that he would soon proclaim St. John of Avila a doctor of the church, conferring one of Catholicism’s greatest honors on the influential 16th century Spanish saint. The title of church doctor is reserved for those churchmen and women whose writings have greatly served the universal church. There are currently 33 such doctors, including St. Augustine, St. Francis de Sales and St. Teresa of Avila. Pope John Paul II added St. Therese of Lisieux to the list in 1997, the last time one was proclaimed. “In making this announcement here, I would hope that the word and the example of this outstanding pastor will enlighten all priests and those who look forward to the day of their priestly ordination,” Pope Benedict said. St. John of Avila, who lived from 1500-1569, is the patron saint of Spain’s diocesan clergy and was considered one of the greatest preachers of his time. A mystic born to a wealthy family, he is known for his theology of the priesthood and is particularly revered in Spain and Latin America, said the Reverend Antonio Pelayo, a Spanish priest who attended Saturday’s Mass. “He lived during a difficult period in the church’s history when the clergy was very relaxed and somewhat dissolute, something that pained him a lot,” Reverend Pelayo said. Pope Benedict’s announcement, while rumored, took many by surprise and drew sustained applause from the seminarians, priests, bishops and cardinals present. [googlead tip=”patrat_mediu” aliniat=”stanga”]Hundreds of protesters against Pope’s visit at the World Youth Day 2011 had gathered outside the Atocha train station aiming to march toward Puerta del Sol but police stopped them before their arrival at the destination by blocking the route. Last night, riot police clashed again with people protesting against Pope’s visit, charging several groups that had been trying to reach the Puerta del Sol square late Friday. The protesters were unhappy with Spain decision to spend 50 million euro ( $72 million) for World Youth Day 2011 and Pope’ s visit at a time of economic crisis. Organizers claimed the event is being funded entirely by the participants, private donors and the church, though the sizeable security costs are extra. Turkey murders latest news. Recep Cetin charged with stabbing to death his girlfriend's mother.